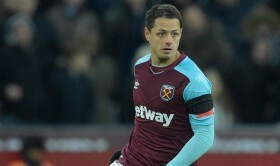 West Ham United have reportedly decided against the sale of Javier Hernandez this month amid the speculated interest from Spanish club Valencia. A recent report from Super Deporte claimed that Los Che are keen on pursuing the Mexico international and they could propose an initial loan deal during the winter transfer window. However, in an exclusive published by Claret and Hugh, the Hammers are understood to hold no interest in sanctioning Hernandez's sale or anyone else's during the current month. The Mexican had struggled for regular gametime until December where Marko Arnautovic's hamstring problem allowed him to become a regular feature from the starting lineup. Since then, he has contributed three goals and an assist from the past five matches but a recent muscular injury of his own has sidelined him from first-team action. Meanwhile, West Ham United have endured a stop-start season in the Premier League amid the vast injury concerns and they are currently just outside the top half of the table with 27 points on the board.